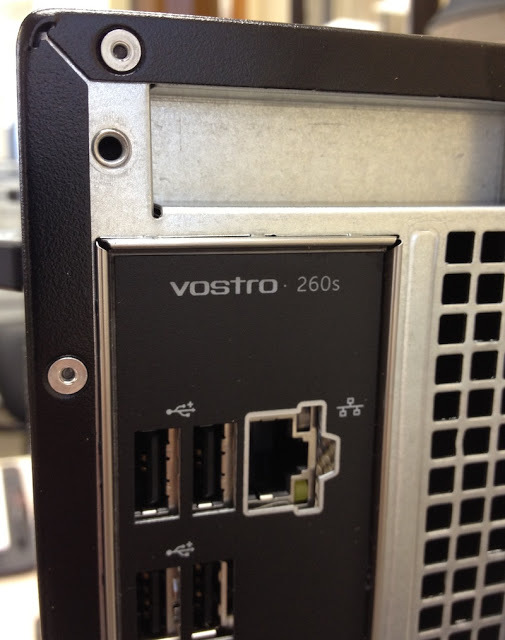 Review: Dell Vostro 260s – Is This Right Form Factor? In a business environment, I’m generally a fan of small form factor machines. They’re usually engineered well and provide the users all sorts of options in terms of positioning. One of the better small form factor machines of the past was the Compaq Deskpro 550SFF (Remember those?). Today, I have my hands on Dell’s Vostro 260s device to set up and I’ll share my thoughts and impressions of this device. The computer arrives in Dell’s standard packaging. I noticed that Dell also uses plastic box inserts (versus the usual styrofoam type). Oddly, Dell places the model of the computer on the case itself but does not reference a number. If a customer would have to figure out physically the exact model number – they’d have to look at the back of the computer. 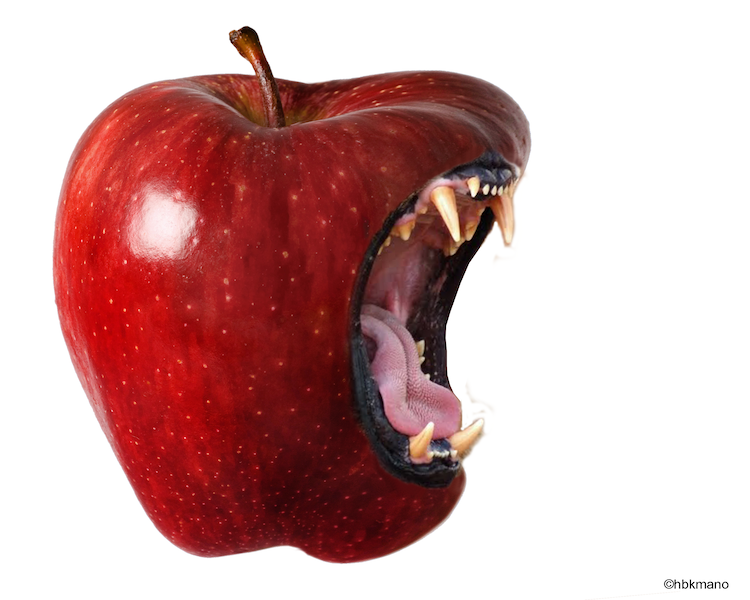 And, speaking if the case there is no easy access to this case – it’s screwed on. “But, a screw is easy!”, a screw is easy, though many of the new machines I’ve seen feature a quick-snap way of getting into the case. Internally, it was fascinating to see the conservation of space at work. The hard drive attachment to the case was very easy to pull out in a plastic covering. The expansion cards were small low profile versions. It also appears as though the base model I purchased included a wireless card and HDMI-out support. Both of those ports will be handy in the future. The beauty of a small form factor machine is the options that come from being so small. There are rubber bumpers on both the length of the box as well as the width of the box so you can place it in either configuration. The version of computer I saw includes what looks like three full fans (including what’s in the power supply). Another interesting discrepancy I came across was related to the power supply. 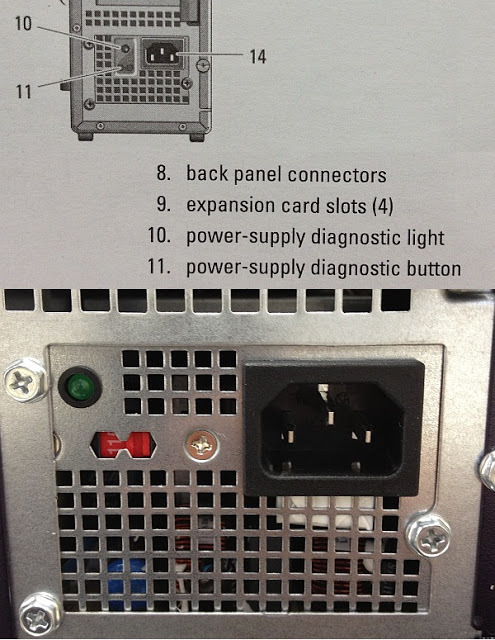 The manual included a reference to a diagnostic light and a diagnostic button on the box. The light was physically there, but the button was missing. I thought that the case itself might have been obscuring the button, but that would have been a very odd placement. Booting up the computer, Dell was up to it’s old tricks. The included Trend Micro’s anti-virus application and the Bing Bar. I still think there will be a point when customers will revolt against such practices. The smart move for Dell is always just include the CD and let the customer install if they want. Something really nice on the system was the way this computer handled the 8-in-1 card reader. 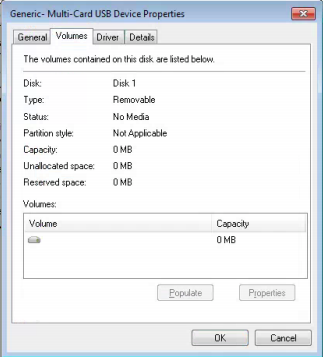 With no card in the device, no drive letters were being used on the system. This is really the way card readers should be handled. All told, not a horrible offering from Dell. 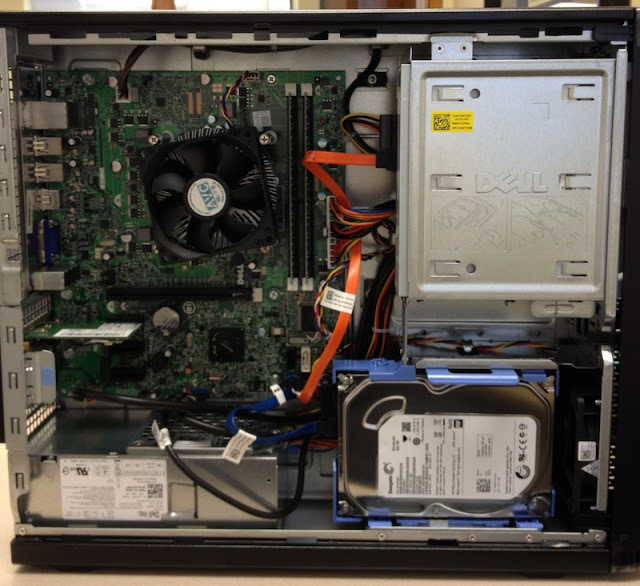 If you’re looking for an entry-level business machine, you could do worse. If buying this, you’ll probably want a nicer keyboard and mouse than the basic ones provided. Dell currently offers this machine with Windows 7 Pro and in deals that include a Belkin surge protector.